Any media logos and or trademarks contained herein are the property of their respective owners and are not an endorsement by those owners of our firm. For close to five years, Keith Singer, founder and president of Singer Wealth Management, has been hosting this daily talk radio show with the mission of helping his clients formulate their goals and then deliver and implement financial strategies through effective processes that will give his clients the highest probability of meeting or exceeding their goals. Daily, you’ll hear timely financial news and topics, along with local and national guest interviews, all geared toward helping you to achieve your financial goals. 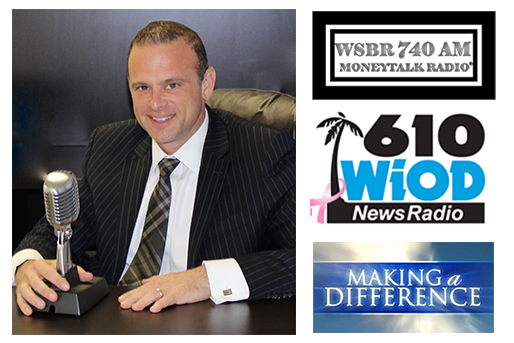 WIOD, 610 AM – NewsRadio, Sundays at 10:00 a.m.
WSBR, 740 AM – Money Talk Radio, Monday-Friday from 9-9:30 a.m. and 2-3:00 p.m.